Helleborus argutifolius “Snow Fever’ still in its nursery pot. Known as a Corsican Lenten Rose, this beauty isn’t as cold hardy as some Lenten Rose varieties. Its parents are native to the Mediterranean islands of Sardinia and Corsica, and it is rated for USDA zones 6-9. The Helleborus argutifolius varieties may also be termed Corsican Hellebore or even holly leaf Hellebore. They are large, bold plants with evergreen leaves which persist year round. These leaves are thick, with toothed edges; but may grow tattered in severe winter winds and weather. This beautiful H. ‘Snow Fever’ has variegated foliage with a touch of dark red on its stems and the edges of the leaves. It is a lovely plant, even right out of the pot, and I was delighted to find it last week at a local garden center. Hellebores have found their way into my gardener’s heart because they not only look good year round, but they give a good long season of bloom when little else is actively growing, let alone blooming in our garden! We already have flower buds on a few of our Helleborus plants, believe it or not. Helleborus already in bud this autumn in our garden. Though most come into bloom sometime in February or March here, some bloom right through from late autumn until spring. Our last Hellebores stop pumping out flowers sometime in late April or May. Corsican Helleborus is known for its abundant clusters of green flowers. But this hybrid promises white flowers, with a shadow of green and lovely pink edges to each petal. It will grow to around 12″ tall, a bit short for the species, but will expand to a wide clump of around 15″. I’ve come to love growing Hellebores in pots surrounded with bulbs and Violas. Sometimes I’ll tuck in an evergreen vine. But these pots look good and remain in dynamic growth all through winter. The plants still look good through the summer months long after the bulbs have died back and the Violas have finished. Last summer I simply moved my best pot into the shade and planted some Caladium tubers around the Hellebore, and had a nice display through most of the summer. Alternatively, if I want the pot for something else in late spring; I’ll move a Helleborus out of its pot and into the ground where it can sink its roots into a permanent home. These are close to ‘care-free’ perennials. First, deer and rabbits won’t bother them. Their leaves are not only tough, they are poisonous. Every part of a Helleborus is poisonous, so they make a nice underground ‘fence’ of roots if you want to protect an area from voles or moles. But Hellebores also prove drought tolerant, tolerate mediocre soil, have few disease issues, need only annual pruning of older leaves, and tend to keep going year after year. Although common advice dictates they grow best in shade, I’ve had a few keep going strong through the summer in nearly full sun. That was a pleasant surprise! The main drawback, for most Helleborus cultivars, is that their leaves aren’t that spectacular. We grow them for their flowers and as a dependable ground cover plant. As much as we gardeners love the flowers, pollinators depend on them as an important food source. These flowers are ready to greet the first of the bees and other insects each year. Hellebores given to us as seedlings by a gardening friend. But just look at this beauty! What unusual and eye-catching leaves! My first one went into a favorite white pot which held geraniums all summer. The geranium held out through the first frost, and so I rewarded it by re-potting it and bringing it into the garage for the winter. I like spunky, tough plants! I’ve not finished dressing this pot yet, because I want to pick up a few Muscari bulbs to sink into the soil around the Helleborus’s roots before I finish it off with either moss or gravel. At the moment, there is a bit of Creeping Jenny and a few Viola starts taking root, which will soon begin to fill the pot with flowers. I bought a second H. ‘Snow Fever’ on Saturday, and have now planted it in the huge pot where C. ‘Tea Cups’ grew all summer in the front garden. The Colocasia’s roots will overwinter in a smaller pot indoors, waiting for their chance to head back outdoors next April. I’ll find a permanent spot for both H. ‘Snow Fever’ in the garden in the spring; but for now, I want to really enjoy them, up close and featured in pots. I’ve surrounded the second one with some starts of Ajuga ‘Black Scallop,’ some Creeping Jenny vines, and the Daffodil bulbs I left in the pot last spring. The Ajuga will keep growing all winter, give blue flowers in early spring, and end up transplanted into a garden bed in early summer. I expect these two pots to give us a great deal of joy over these next few months. You’ll probably see lots of photos of these special Hellebores as they grow and eventually bloom. If you love Hellebores, or are curious to know more about them, I recommend the excellent and beautifully illustrated article in the December Gardens Illustrated on new Helleborus cultivars. Gardens Illustrated is an UK magazine, but is absolutely the best source for information on plants and horticulture I’ve found. It doesn’t matter that it is UK based, as much of the information translates just fine to our East coast USA garden! I like it even better than Fine Gardening, which also offers solid information and advice on garden design, and is based here in the United States. February 2016 Hellebores grow here with Autumn ‘Brilliance’ fern, which also remain evergreen through our winters. Some of the Helleborus foliage shows wind and cold burn, and these older leaves should be removed in early spring to make room for new growth. This is the time of year to shop for Hellebores. You may not find any blooming, but you will definitely find them available in many garden centers in December. They are pricey, and named cultivars generally have been grown on in greenhouses for at least a couple of years from tissue culture. Variegated cultivars, like H. ‘Snow Fever’ may not be easy to find in all parts of the country. But if you live in Zone 6 or warmer, you might want to try ordering from an online source to give this beautiful plant a try. To simply get started with Hellebores, though, find a friend or neighbor who has a patch growing in their garden, and ask whether they might like your help in thinning them. Hellebores seed their offspring generously, and many gardeners are happy to share seedlings. You may have to wait a season to see them bloom, but the wait is well worth the reward. A new Caladium on the market, ‘Sweet Carolina,’ has already found its way into my gardener’s heart. This recent introduction, bred in 2002 by Dr. Robert Hartman, CEO of Classic Caladiums, resulted from his cross of C. ‘Grey Ghost’ with pollen parent C. ‘Miss Muffett.’ ‘Grey Ghost’ lends its vigor, its true green coloring and tolerance for sun; ‘Miss Muffett’ lends the interesting chartreuse coloration and pink veins and splotches on the leaves. But ‘Sweet Carolina’ surpasses both parents for size and vigor. 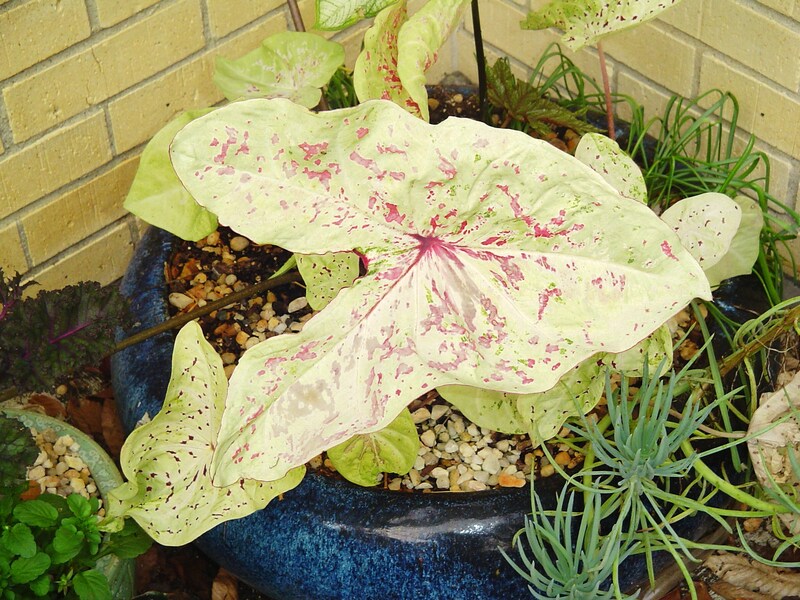 Considered a ‘fancy leaf Caladium,’ these beautiful leaves resemble large hearts. Our package of tubers arrived from Classic Caladiums in the first week of August, and I planted a few in pots right away. The staff very generously sent more than I ordered, which were shared with a number of gardening friends. These friends and I are growing out ‘Sweet Carolina’ and the dwarf ‘Cherry Tart’ to observe how they grow for us in Virginia. We’ll send photos and our notes back to the folks at Classic Caladiums in October, the end of the Caladium season for us. ‘Sweet Carolina’ unfurled its first leaves for us around August 24, less than three weeks after planting! All of the tubers I planted haven’t yet sprouted, but they were planted over a period of about 10 days in various conditions and types of soil. And of course, a week of growth isn’t nearly enough for me to see the full potential of this plant. This is the first pot of ‘Sweet Carolina’ that I planted on August 6. There are 4 tubers in this pot along with 3 rooted cuttings of Coleus, ‘Bone Fish.’ The dry leaves on the ground are new ones fallen from our trees this week… It is that dry here! ‘Sweet Carolina’ is said to grow to over 36″ tall! That is just enormous for a Caladium! I’ve never grown one that topped out much over 24″. None of these new plants are growing in full sun. The heat and sun have been too intense here this month, and so far I’ve kept them in full to partial shade. But I’ve been moving some of the pots to sunny spots as the leaves begin to grow. And these do grow very fast! I’ll keep taking photos as the ‘Sweet Carolina’ plants develop and we’ll learn about them together. You can see that the leaves are growing very quickly and will soon make a large, beautiful display here, in partial sun. Begonia ‘Gryphon’ and Dichondra ‘Silver Falls’ grow in the pot behind. The first of the ‘Cherry Tart’ Caladiums planted showed themselves yesterday. The first leaves are a lovely rosy red, and the tubers are quite vigorous with multiple leaves breaking the ground at once from each. Watch for photos of these beauties in the coming days! Breeding better plants proves exciting, but painstaking work. There is inspiration to select the best parents for a desired result; but then there is a long time to wait for the seeds to develop and grow on before any real judgements can be made. I admire the work of Dr. Hartman, and also the staff at the University of Florida for their contributions in the field of Caladium research. I know Caladiums would be far more popular among my gardening friends if they were hardy to Zone 7. This is ‘Miss Muffett,’ pollen parent (father) of ‘Sweet Carolina.’ Do you see the similarity? Sweet Carolina will grow taller and will have bigger leaves than either parent. Currently these plants are considered tropicals, hardy only to zone 9 or 10. That said, one of my friends swears that Caladiums she left outside over the winter in a large barrel, well mulched, returned this summer! And I have been surprised by the Caladiums which continue to sprout in pots, overwintered in our garage, that have shown themselves only in recent weeks. Obviously, the more recent hybrids on the market have improved tolerance to cold. This tuber was planted nearly a week later than the first, and the leaves have just begun to emerge since Saturday. 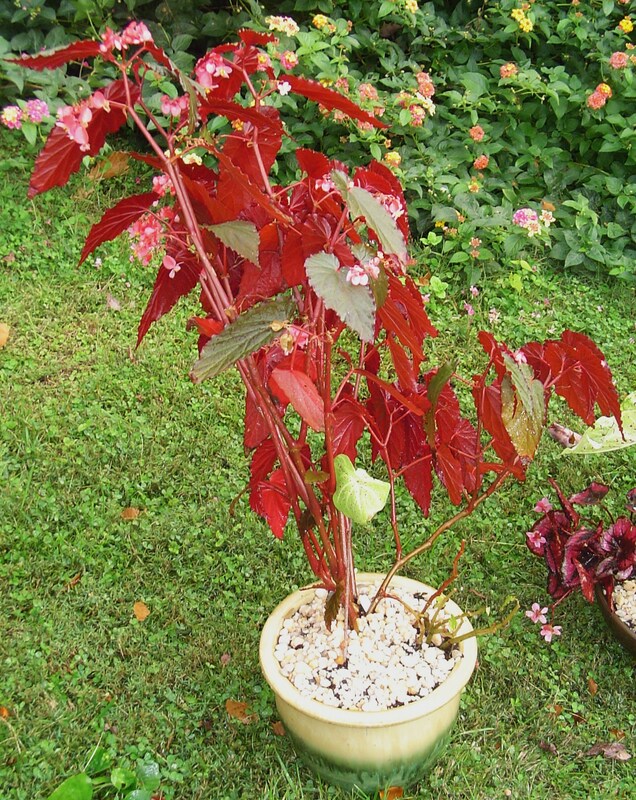 It is planted with Begonia ‘Arabian Sunset’ and Begonia ‘Richmondensis.’ This one has had more sun since it emerged and you may notice the leaf is darker here. Besides cold tolerance, newer hybrids can take more sun, grow larger, produce more leaves, and grow faster than the older Caladium varieties. And, of course, there are always new colors and patterns on their beautiful leaves. We appreciate Caladiums in our garden for their long lasting beauty, but add more each year as they are one plant the rabbits and deer definitely leave alone! We can plant them with confidence, knowing we will actually enjoy them over a long period of time. Caladiums appreciate a good meal, and I am watering with a dilute solution of Neptune’s Harvest to supplement the Osmocote already in their potting soil. They don’t suffer from any blight, disease or infestation in our garden; which is saying a lot! All they require is regular moisture and a light grooming as older leaves fall and fade. Do you like the leaf of ‘Sweet Carolina’? Is this a color combination and pattern you would choose for your garden and pot designs? 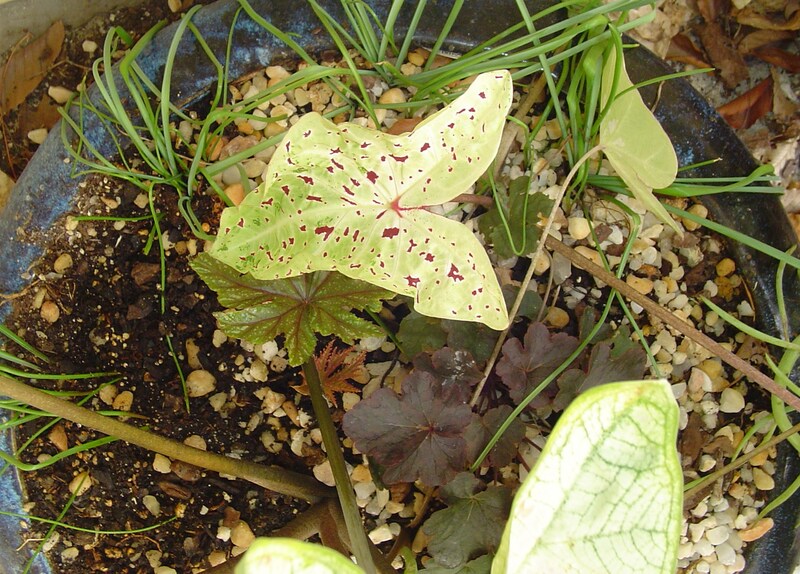 Grown primarily for their leaves, Caladiums do produce simple, but interesting, flowers. Many gardeners cut these away as they appear so the plant’s energy remains invested in producing more leaves. I find the pink splotches a charming shade, going well with the flowers I already have growing nearby. I’ve planted tubers in combination with angelwing Begonias, Creeping Jenny, Heuchera, ferns and with Coleus. These seem good companions thus far, but we’ll see how the combinations work as the Caladiums grow. If you are interested in growing Caladiums, you’ll probably need to wait until next spring to plant tubers. A few local garden centers still offer actively growing plants in pots. They still had a reasonable selection to choose from when I bought a pot of C.’Aaron’ for my father last week. But Florida growers stopped shipping bulbs around the end of July. You can still place your order now for next spring, to make sure you can get the choice tubers of new introductions, always in short supply. August 23, about 17 days after planting, as the ‘Sweet Carolina’ Caladiums first began to grow in this shady and protected spot . Caladiums beginning to look faded at the end of their season outside. The Caladiums have about reached the limit of how much cold they will tolerate. We love their huge colorful leaves, and wait as late into the season as we can before disturbing them. But, it is time to come indoors for the winter. With the first few Caladiums already lifted, it is easier to see what is growing in the pot. Some gardeners bring them in and successfully dry the tubers. I’ve not had a high success rate with packing the tubers away in peat moss or sawdust for the winter, and so I prefer to leave the plants growing in pots, and bring the pots inside. When brought into the living room, they will normally die back for a few weeks to rest, and then sprout new leaves early in the new year. This makes it easy to keep up with them, and then transplant them back outside the following May when the weather has warmed up for good. It is just a little too cold in Virginia to leave Caladiums outside all winter. They will freeze and die. 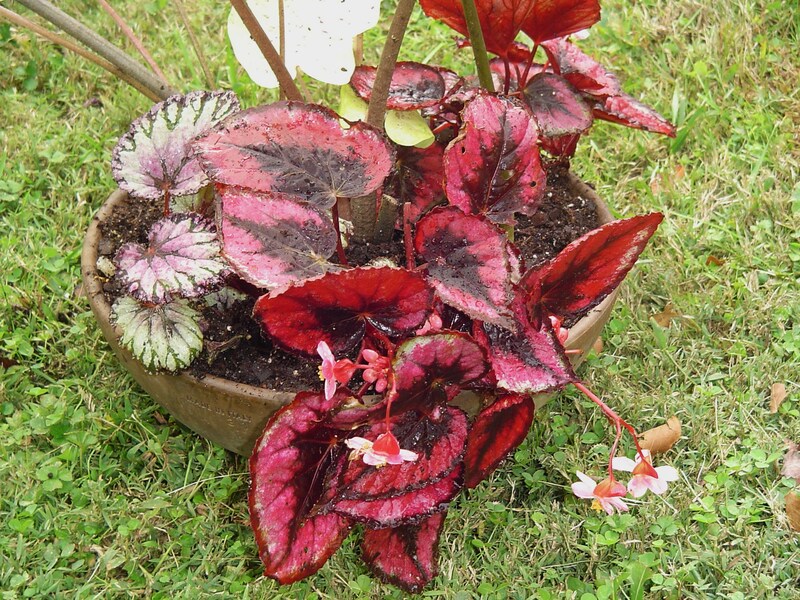 This pot was spectacular all summer with its red Begonia Rex and a red leaved cane Begonia. Both need to come inside now that night time temperatures dip into the 40s. Our large pots tend to be temporary homes for a variety of plants. The pots stay in place and the plants come and go with the seasons. So this afternoon I tackled the Caladiums and some of the Rex Begonias. When the Caladium leaves begin to fade, and several nights in a row dip below 50, its best to lift the tubers and find them a winter home. Begonia Rex, purchased in a 1″ pot in April has grown beautifully in this protected pot on the patio. Anything we can do for tender plants is better than doing nothing. Lifting them, and losing some roots and leaves, to bring them inside at least gives them a chance to survive. Some will thrive, some will languish. It is a chance we take. We can only be as gentle as we can be, minimizing the time roots are exposed to the air. This is different than standard re-potting since plants are dug out individually. Its good to do this on a fairly warm, overcast day. Assemble pots, fresh soil, trowel, clippers, fertilizer, bulbs, transplants, gloves, and water before beginning to dig. Once started, try to move each plant as quickly and gently as possible, watering it into its new pot so the roots settle firmly into place. I recycled some pots which held Coleus this summer. The Coleus has grown leggy and is fading in the cooler temperatures. Coleus cuttings will survive the winter in vases of water. It is best to start with fresh plants each summer anyway, so this year’s plants are discarded when they fade. 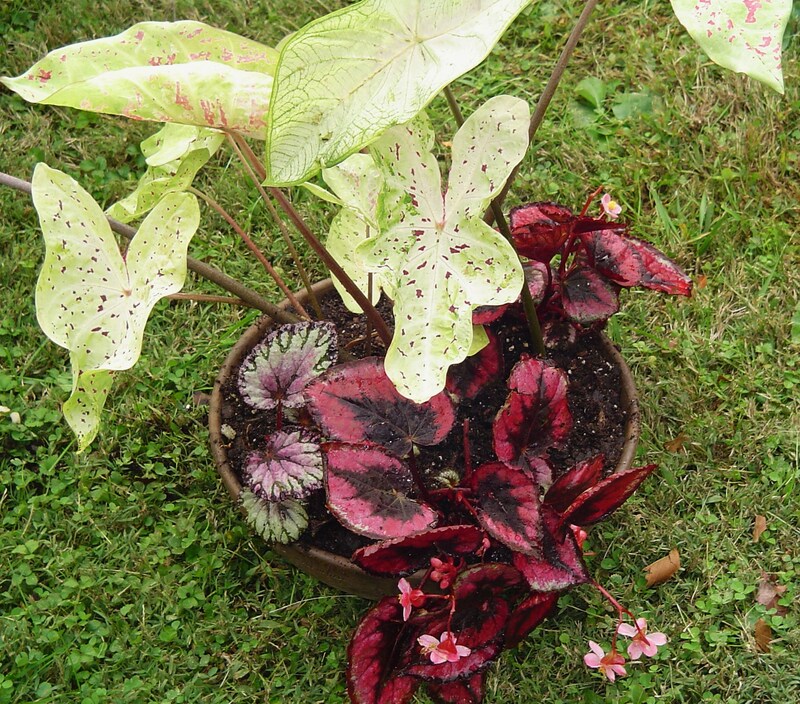 Transplanted Caladiums and Begonias now share this 14″ shallow pot. They will live in our living room this winter. The Caladiums will die back, but will send out fresh leaves in early spring. They can remain together or get divided up and replanted outside when spring 2014 is settled and warm. 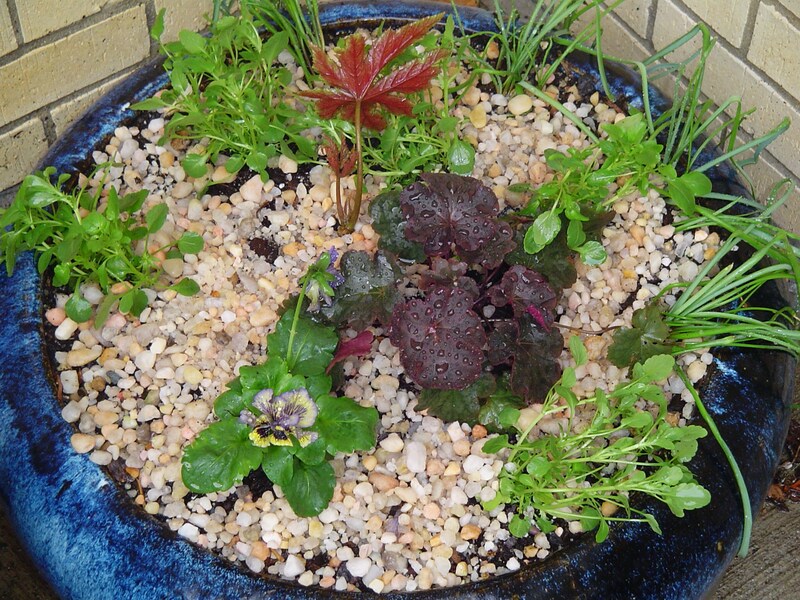 Prepare the pots by mixing some Plant Tone into the recycled soil, or begin with all new potting soil. Scoop out a bowl shaped depression to receive the transplants. Probe around each Caladium tuber with the trowel. It’s hard to know how large the tubers have grown, but expect them to be larger than what was planted in spring. Begin a few inches away from the living stems, and scoop under the tuber from 3 or 4 different angles to loosen the roots. 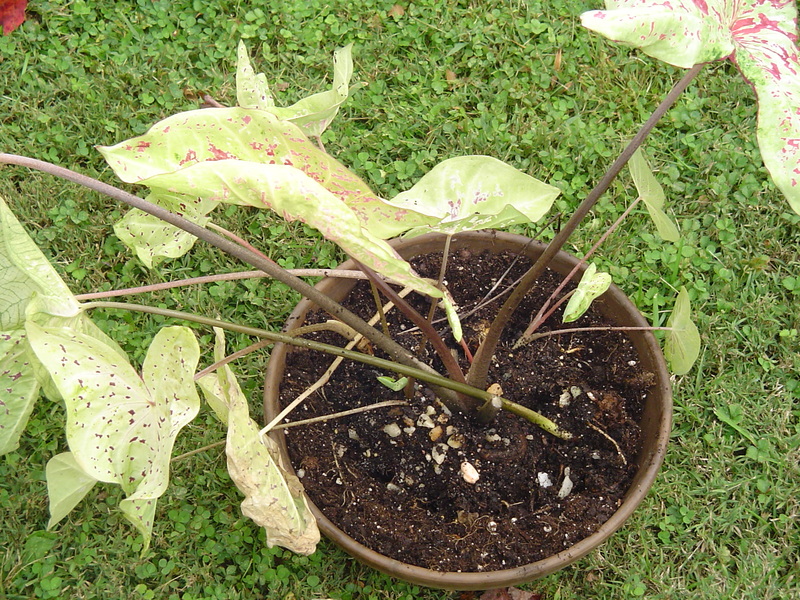 Settle the roots of each Caladium into the pot, spacing them a few inches apart. Reach under the entire tuber and lift the plant in the palm of your hand, gently shaking some of the soil back into the summer pot. Place the tuber into the new pot, settling the roots, and push the first few tubers towards the edges. Make sure there is soil between the side of the pot and the tuber. Continue lifting tubers one at a time. They should be spaced several inches apart. Expect that the leaves will die back, and unless you add another plant or two, the pot will appear to be empty for much of the winter. Since the pot is coming into the living room I pot up Caladiums with something else that will live all winter indoors. I mixed these Caladiums with three of the Begonia Rex who have been outside in this same area. 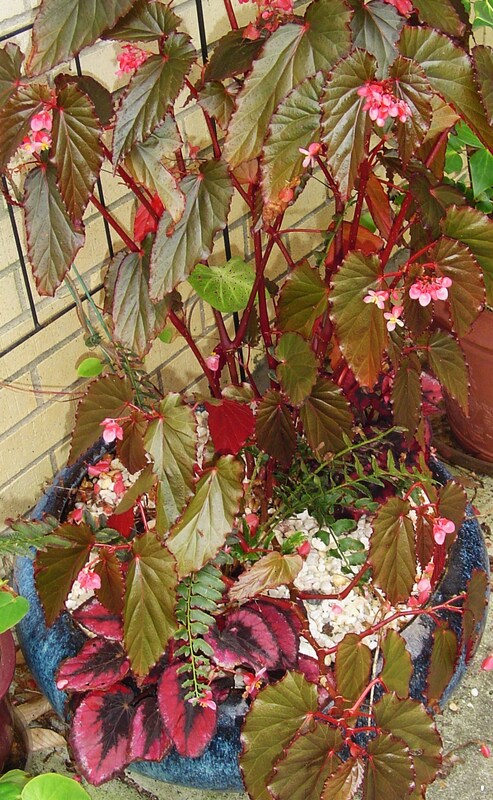 Gently probe around each Begonia plant, and gently lift it in the same way, shaking away excess soil. You want a fairly compact bit of soil and roots to transplant. One Begonia is leggy and should be pruned back, the other was already pruned by hungry deer. Both will spend the winter in the warm living room. Settle these in between the Caladium tubers, and fill in around each plant with fresh potting soil, as needed. Finally top off the soil with a layer of gravel mulch, and spray gently with a fine mist of water to rinse the leaves and pot and settle the roots into place. 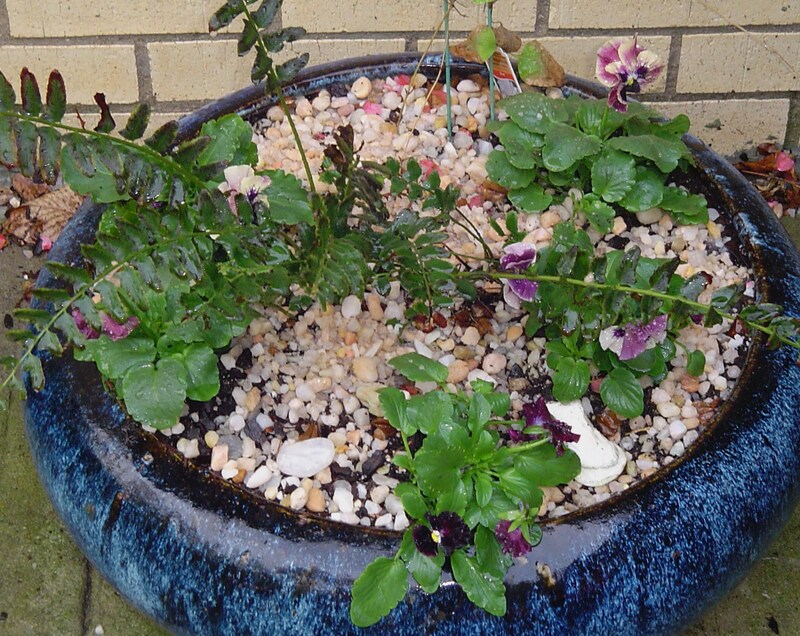 This pot is now ready to come inside for the winter and will do well in bright but indirect light. A Heuchera anchors the newly planted Panola and several Violas. 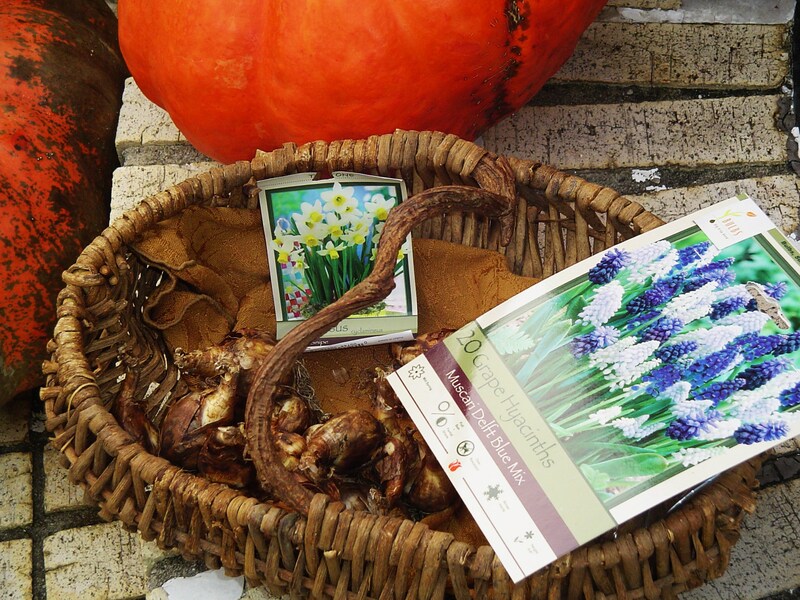 Grape Hyacinths and miniature Daffodils will fill the pot out in spring. Last year’s Grape Hyacinth bulbs have already grown leaves. The pots which will over winter should be stripped of all tender plants, leaving only those hardy enough to survive the cold. I’ve left a fern and a Clematis in one pot, and a Heuchera, sprouting Grape Hyacinth bulbs, and a cutting of Begonia Gryphon in the other. 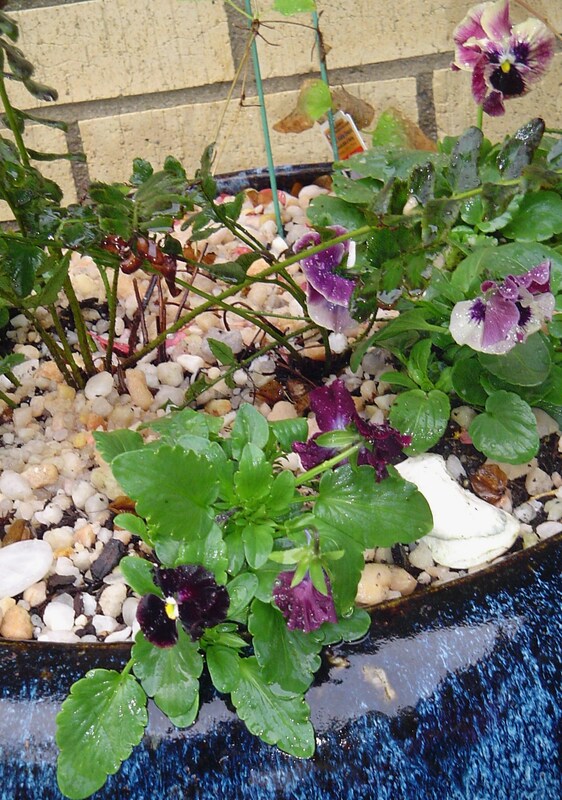 Both of these pots will receive Violas and bulbs for winter and early spring blooms. Since both are heavy feeders, and will be expected to bloom all winter, it is smart to begin by digging in some Plant Tone. Next plant any bulbs. I’ve added some additional Grape Hyacinths and miniature Daffodils. I used the same bulbs in both pots I replanted today, so they will bloom together and look similiar next spring. Finally, I transplanted the Violas, topped off the pots with some fresh gravel mulch, and watered with a fine mist to wash away stray potting soil and settle the roots into their new pot. Beautiful Panolas with their ruffled petals fill this pot, underplanted with Grape Hyacinths and miniature Daffodils. A fern, planted last autumn, is beginning to spread. A Clematis vine, new this spring, will spend the winter in the pot ready to grow again in a few months. Both pots look much better now that they are cleaned up and replanted for the winter. The large, leggy Begonia has more room to grow in its new pot, and is partnered with what is left of a Begonia Boliviensis which was badly grazed by deer. Safely inside, I expect it to leaf out again and possibly bloom over the winter. The large Begonia will drop a few leaves as it adjusts. I can cut back each of the branches to stimulate fresh growth lower on the stem. Sometimes I share these cuttings with friends, and sometimes give them the mother plant. These Begonias root so easily I always have more plants than I can reasonably bring in for the winter. This one was a rooted cutting when it went outside in late April, and has grown quite huge over the season. A Begonia Rex remains in the pot with the new Camellia, now protected from grazing deer with cuttings of scented geranium. Finally, the Coleus protecting the new C. “Jingle Bells” had to go today, too. It was hit by cold last week, was dropping leaves, and looked pretty ratty. 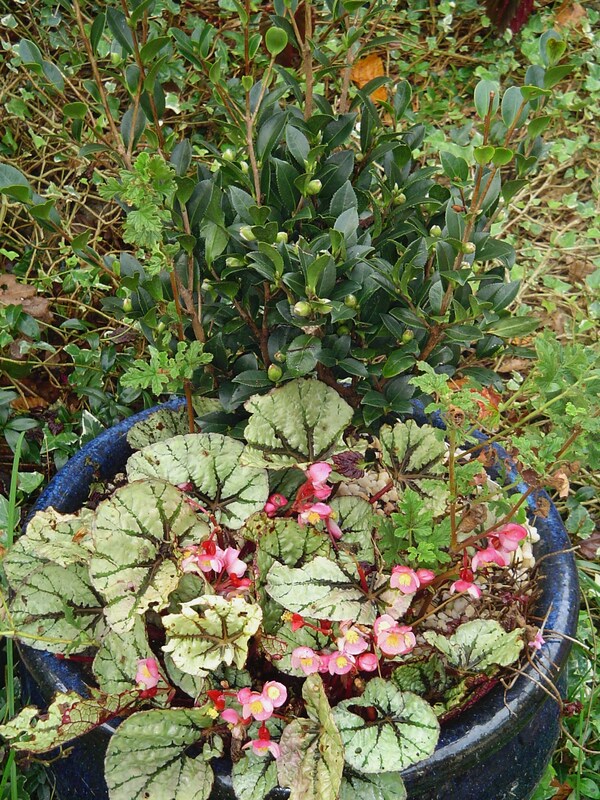 I lifted one of the Rex Begonias in this pot, but left the other in place a while longer. 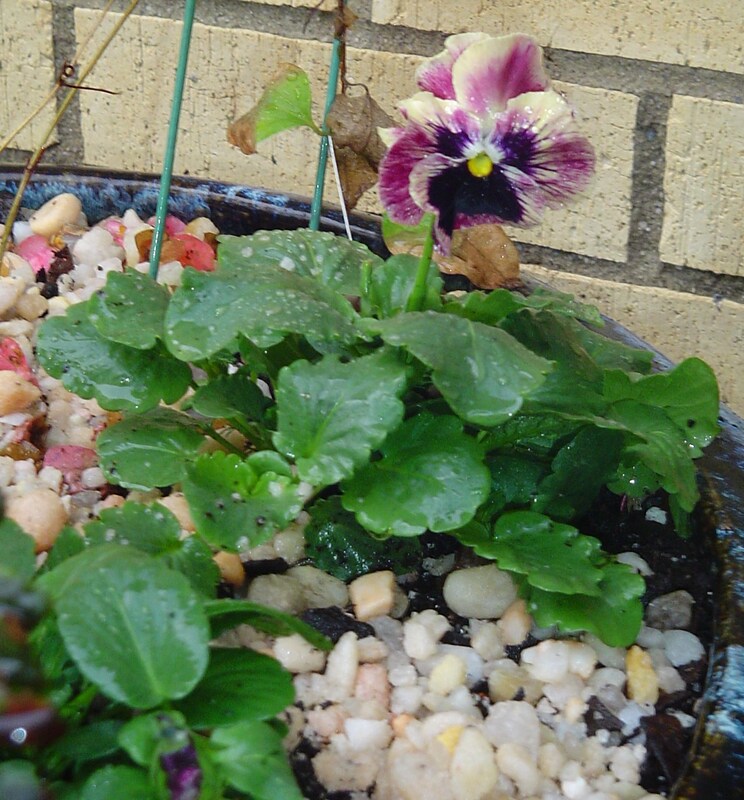 Sometime soon I’ll lift it and plant the entire pot in Violas. I’m concerned about deer attracted to the Violas also eating the Camellia buds, so the change over for this pot is gradual. Today I took large cuttings of some leggy scented geraniums. I’ve read some accounts lately of other gardeners successfully protecting plants with the highly fragrant scented Pelargonium. Although I hope these cuttings root, if they don’t, they will remain fragrant and continue to protect the Camellia for many months. These particular Pelargonium normally aren’t hardy in Zone 7, but several survived last winter. Although the leaves eventually died back in an extended bit of frigid weather, the roots lived and the plants grew back this spring. It is a luxury to have space indoors to keep plants through the winter. It also takes consistent attention to keep each pot properly watered, the leaves picked up, and the plants rotated so they get sufficient light. It is an investment of time and love, but the reward of much loved plants surviving from one summer to the next makes it worth the effort to bring in as many plants as one can when autumn nights grow cold. Panolas are a fairly new hybrid,. They combine the hardiness of the smaller Violas with the larger face and brighter colors of true Pansies. These “Violet Picotee” are some of my favorites with their ruffled petals. All of these Panolas and Violas were raised by the Patton family and sold at their Homestead Garden Center in James City Co., Virginia.